Lock in a great price for Villa Gdynia – rated 8.6 by recent guests! Friendly staff and decent breakfeast. Location is good, in the quiet green neighbourhood, close to beach and not so far from city center. Sadly that's it. Bardzo wygodne i przyjazne miejsce. Czysty, przestronny i komfortowy pokój. Cicha okolica. Dobry pomysł z kuchnią dostępną dla gości przez cały czas. Miła obsługa. Przepyszne śniadanie. Polecam! Room was spacious, beds were soft, clean and comfy. Place located in a calm and distant from city center area. Great choice only if you have a car! Staff was kind. Breakfast was simple, but nice. Nice location. About 20 min. walk to the major shopping street with many cafes. Bardzo dobra lokalizacja i miejsce zwłaszcza w delegacji. Bardzo wygodne łóżka. Super pokoje. Mili Właściciele. Villa Gdynia is located by the Tricity bypass, only a 10-minute walk from the SKM City Rail stop. It offers elegant rooms with free Wi-Fi and an LCD TV. The famous pier in Sopot is 3.1 mi away. Each room includes a spacious bathroom with bath or shower. There is a work desk, ironing facilities and free toiletries. A breakfast buffet can be arranged. The staff can arrange children care equipment for you, such as a bath, a crib or a playpen. There is a large children's playground within walking distance. Villa Gdynia is located 0.9 mi from a beach promenade, next to the Tricity Landscape Park. Wzgórze Św Maksymiliana is a great choice for travelers interested in promenades, restaurants and ambiance. 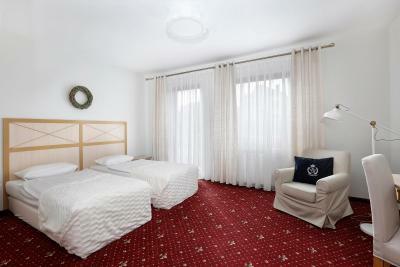 This is our guests' favorite part of Gdynia, according to independent reviews. 뀐 Located in the top-rated area in Gdynia, this property has an excellent location score of 8.4! 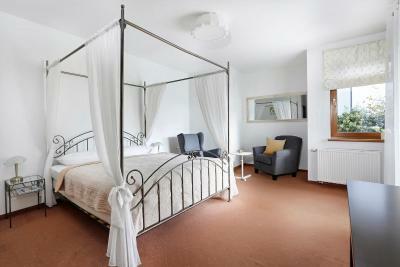 When would you like to stay at Villa Gdynia? Room decorated in bright colors and equipped with an LCD TV. There is a spacious bathroom with shower and hairdryer in every room. This apartment has a satellite TV. Area Info – This neighborhood is a great choice for travelers interested in promenades, restaurants and ambiance – Check location Great location - show map Guests loved walking around the neighborhood! House Rules Villa Gdynia takes special requests – add in the next step! Any additional children or adults are charged PLN 80 per night for extra beds. Villa Gdynia accepts these cards and reserves the right to temporarily hold an amount prior to arrival. The room smelled like a sewer (because of the strong odor comming from bathroom pipes). The cleanliness in general was way below any standards, we had human hairs on the bedside table and stains on the bedsheet. Furnitres were a little bit worn out and mixed. That was just one night stay so we decided not to spend time arguing and changing rooms but for longer stay we would definitelly not leave it like that. If travelling without a car, place is distant from all main attractions as the street it's in has a limited access (two ways only). Lights were dim, TV not working, no trash bin, stains on the carpet, clogged sink - generally place was clean, but aged. I felt overpriced for the facilities I've got. Breakfast was poor. Our room was way smaller than any room in pictures ,with a constant smell. Absolutely no value for money , disappointing. The breakfast was very simple. Almost no choices. Nobody at check-in. Room keys were on the table. The beds were by far too soft. No Wifi connection in the room. Bed was not very comfortable. Very good rooms. spacious. friendly personnel.